Sheffield City Council have installed Oxane LED complete with sophisticated ground breaking CMS technology to provide the city with a lighting scheme to be proud of. 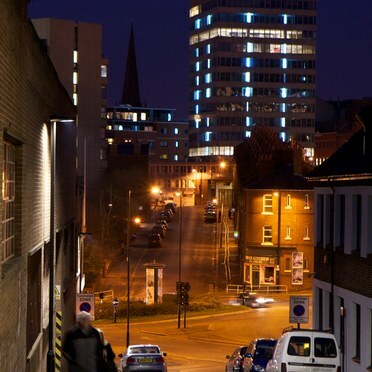 Oxane LED has been chosen as the luminaire to replace old lighting units in the Garden Street Area of Sheffield. If these ongoing installations are successful, and already they look good, the city will look to refurbish more streets using LED technology in the coming years. This will enhance the night time street scene, contribute to reducing the fear of crime and will significantly contribute to energy reduction which supports the authority’s carbon reduction commitment. The objective of the replacement scheme was to replace life expired equipment with lighting units that provided good quality lighting at appropriate lighting standards whilst reducing energy consumption to a minimum. The lighting from the existing luminaires was a mixture of SON & SOX lamps which produce poor colour rendering and poor uniformity of light within the area. The lead engineer Jonathan Skill wanted to reap the energy reduction benefits available by considering the variation in pedestrian and vehicle usage and tailoring the CMS technology to dynamically reduce or enhance as necessary the level of illumination of this inner city location. By using an LED solution for the scheme the Council were able to have instant light with exceptional colour rendition properties, which allowed the Council to reduce the lighting standard by one class as allowed for in the current British Standards for S class illuminance levels on the highway. In this case the road lighting classification was reduced from S3 Lighting Class to S4. This reclassification of roads based on the colour quality of the lighting is common practice in the UK and is agreed in the relevant lighting standards, and offers significant benefits in energy reduction. Sheffield also have the benefit of extra energy savings through using Oxane LED coupled with CMS technology as it allows them to ‘trim’ the switching times giving instant energy savings which is directly related to the light level chosen, it also increases the LED life without affecting efficiency. Their chosen lighting management system will enable them to tailor their lighting levels according to local events , should this ever be a requirement, for example heavy traffic density or increased pedestrian traffic around local events can be immediately responded to if necessary. The City Lighting Engineer Bob Stevenson stated that "In using Oxane LED together with CMS technology we are able to tailor lighting levels to specific times ensuring we have the appropriate lighting standard for the pedestrian and traffic flows and have the ultimate dynamic control to only pay for energy consumed".